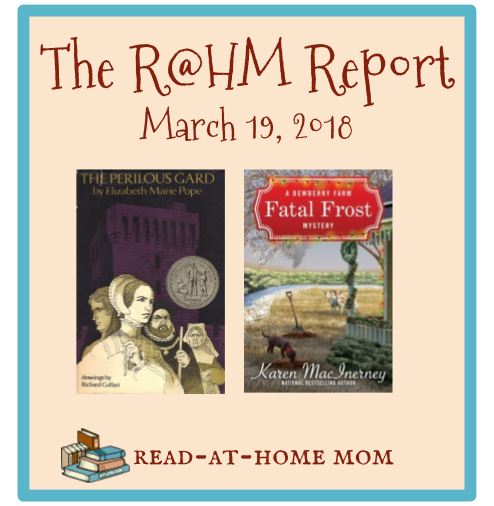 This week's RAHK Report includes our St. Patrick's Day read-alouds and the book my four-year-old has been reading to my two-year-old. I had a hard time getting into this book at the beginning, but things really picked up after a few chapters and it ended up being a really compelling mystery. I was wondering at first whether I'd stick with the series, but I've decided I definitely will. This was really good in a creepy sort of way. I think I prefer The Sherwood Ring, just because it's more like my usual type of book, but this was very good. I will probably have a review up in about a month. This series is growing on me. Herculeah is certainly a unique heroine. I liked this third book of the series a lot. I'd been hoping for a book devoted to the tension that other associations introduce into the Al//unnamed narrator friendship, and this was it! I read a bit in this one this week. I'll be out of town over the weekend and into the early part of next week, so I may not finish it right away, but probably by the time I post another RAHM Report in two weeks, it will be done. I've started this ARC a couple of times, but I keep getting distracted. Hopefully I'll be able to sit down and really focus on it before we leave for our trip. Fatal Frost counts for Cloak and Dagger and Craving for Cozies. The Perilous Gard and Your Old Pal, Al count for Old School Kidlit. Dead Letter counts for the Author Love challenge. I also published reviews of the following titles for the Writing Reviews challenge: Southern Discomfort by Caroline Fardig; Fit to Die by Ellery Adams; Happy Little Family by Rebecca Caudill; and A Girl Called Al by Constance C. Greene. Nice variety of books. I liked The Sherwood Ring better too. Come see my week here. Happy reading! I'm really interested in reading The Perilous Gard. It's part of my Newbery challenge, so I will eventually get to it. Thanks for sharing and have a wonderful reading week! 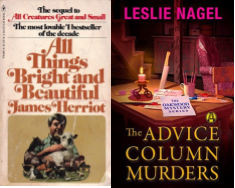 I like the Advice Column Murder book-that looks good! Also Fatal Frost -sounds like something we live through in the winter-LOL. I see you're doing the Alphabet Soup Challenge also!! Have a great day!! Your Old Pal, Al looks really familiar. I may have read that as a kid. I really enjoyed Cleary's audio collection. I think there may be a Ramona one also. I'll have to look it up. I'm glad I got to "read" books of Cleary I never read before. Thanks for poppin' in. Betsy Byars is an author that I haven't thought about in a while! I loved her! The Perilous Gard caught my eye - looks very interesting! And, wow, five stars!